Wellcome to the home of the Vintage Vollies. We chose that name because it was accurate for not only the apparatus and equipment that we collect, but ourselves as well. Although the site is still in somewhat a state of construction, please feel free to wander around as we are trying to get photos and info on the site as quickly as we can. Basically, we are a couple of guys that spent a lot of years involved in the fire service that like fire trucks. Billy Braun lives in Genesee, PA and owns most of the apparatus that you'll see featured on this site. Mike Healy now lives in Sebring, FL after spending most of the last 30 years living in the Southern Tier of NY state and North Central Pennsylvania. 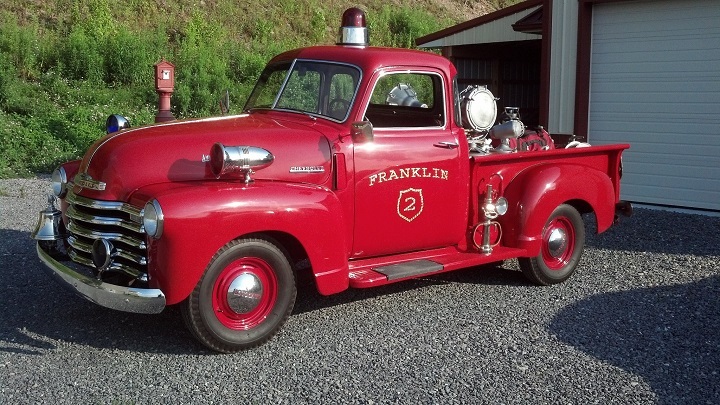 Billy and Mike have been friends for close to 30 years and actually met as the result of a friend of Billy's stumbling across Mike with his 1949 American LaFrance 700 Series pumper at a car show in Angelica, NY in 1987 shortly after Billy had bought his 1954 American LaFrance, Franklin-1. The rest as the say, is history (literally). 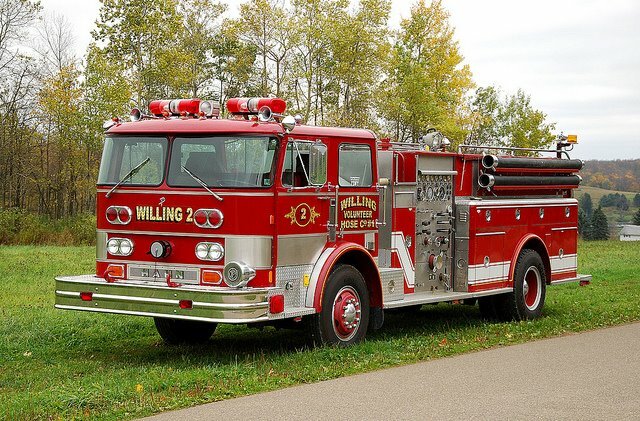 In addition to fire apparatus, Billy enjoys collecting emergency lights and sirens, in particular those manufacturer by Federal Sign and Signal as well as Sterling. Mike and Billy both also collect Gamewell Fire Alarm equipment and have a number of various types of street boxes as well as gongs, tape registers and an indicator. The beginning of August saw Franklin making the long treck to Syracuse, NY for the SPAAMFAA national convention and muster. There were more than 80 pieces of apparatus in attendance at the four day event that included a static display at the host hotel on Friday as well as a mini muster at the inner harbor (there was something in the water there). Events continued in Saturday with the big muster with both mass pumping and static displays. Photos of Franklin at the event can be found in our photo gallery. This is Franklin-2, a 1949 Chevrolet Thriftmaster pick-up that is owned by Billy. This little rig has been set up as a "plug buggy" or utility type vehicle. It has a variety of light equipment in the bed including several large flood lights and a generator. This photo was taken shortly before Franklin-2 headed out on the 500 mile journey to Frankenmuth, MI for the SPAAMFAA summer national convention in 2012. We have had some changes to the fleet in the last couple of months. In September the former Auburn, PA 1963 Ford/Hahn was sold to another collector in Delaware County PA. He had lost his original collection in a tragic fire caused by a propane fire in an adjacent building. A total of 7 vehicles were lost in the blaze. Plans are to restore the truck to original condition. He hopes to have it at the PA Pump Primers muster in Harrisburg in July 2012. 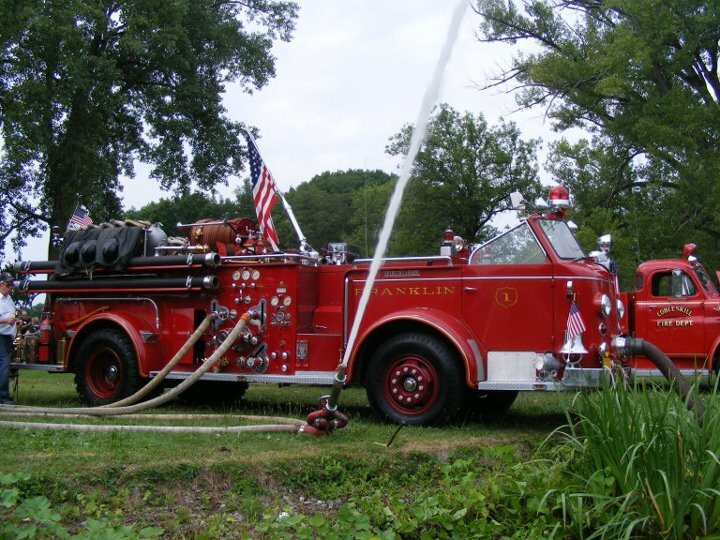 In October we were able to acquire a 1978 Hahn 1000 GPM pumper, former Smyrna, Delaware. I had driven this particular apparatus many times during the time it was in service with the Tri-Town Fire Co of Ulysses, PA. The pumper is in good condition despite some rust issues in several locations. It is certainly a good running truck. The Smyrna engine is powered by a Detroit 671 deisel and a fuller 5 speed manual transmision. It is equiped with a 1000 GPM Hale pump and a 1000 gallon poly booster tank. Smyrna is currently being housed in the Coudersport, PA area. It is planed for Smyrna to attend a number of area parades and musters in the coming year including the PPP muster in Harrisburg. Photos of the Smyrna engine can be found in our photo gallery. 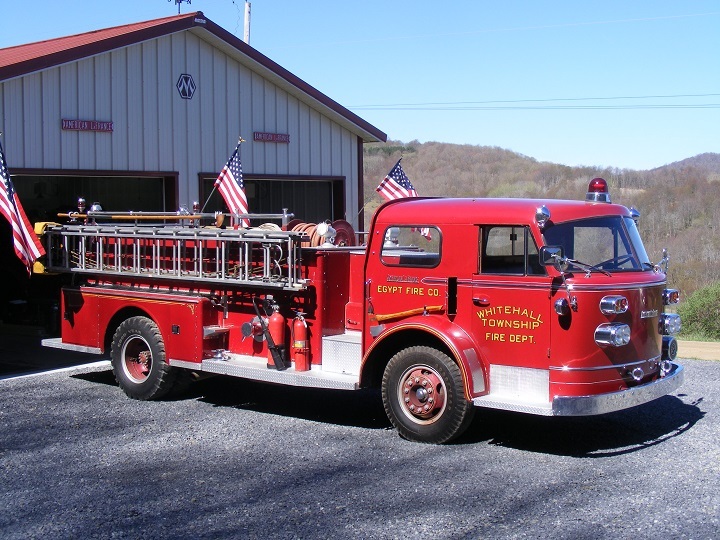 This is a 1958 American LaFrance 900 Series pumper, ex-Whitehall Twp. PA. It is owned by Billy Braun and was added to the fleet in 2012. 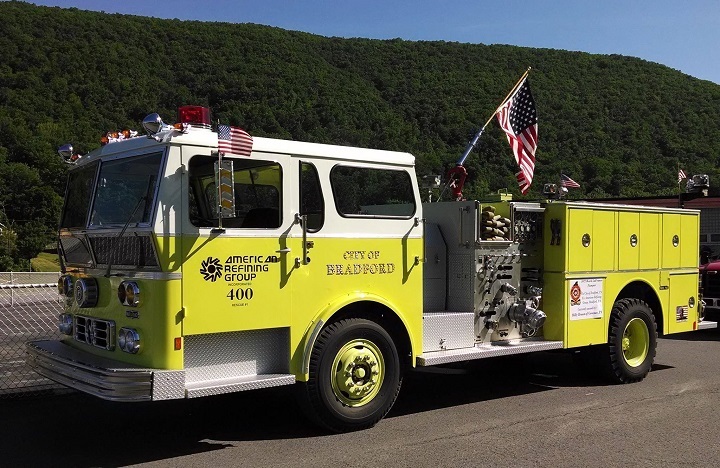 This 1977 Ward LaFrance, former City of Bradford Engine 2, was purchased by Bill Braun from the American Refining Group refinery in Bradford, PA in the fall of 2013. This photo was taken at the Red Suspenders Weekend parade in Galeton, PA in the summer of 2014.